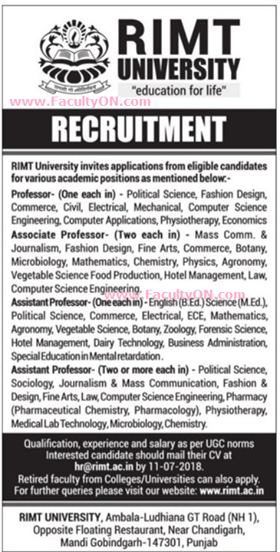 RIMT University, Punjab has advertised in Tribune for the recruitment of Professor/Associate Professor/Assistant Professor jobs vacancies. Interested and eligible job aspirants are requested to apply with in 11th July 2018. Check out further more details below. College Profile: Driven by a strong inclination to assign the futuristic parameters to given standards of education today, RIMT carries forward its illustrious history since inception in 1998. Continuing on its path of growth, RIMT experienced the greatest period of momentum in its history while adding a new institution every year from 2002 to 2018. This legacy continues with RIMT Universtiy established by Govt. of Punjab vide Punjab Act, No. 31 of 2015 & under section 2(f) of the UGC.